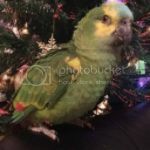 Parrot Forum • View topic - What's the best way to Bathe a Parrot? How does everyone else bathe their Parrots ? 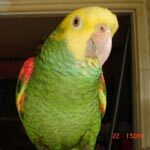 Re: What's the best way to Bathe a Parrot? Mine will only accept spraying. No baths no showers whatsoever. Myrtle will only accept spraying her. Rainbow likes spraying and catching the water running off the shower curtain. He does not want the shower spray. I have not seen a cockatiel take a bath but they really cluster together when I bring out the spray bottle. Picture that many little birds doing the "Momma spray me" dance at the same time. liz wrote: Myrtle will only accept spraying her. Well, first of all, you should NEVER use warm water (it strips the natural oils out of their feathers and skin) - second, I would not recommend forcing a bird to take a bath (it would only traumatize it). My senegals are not good bathers (neither are my grays) but they do take a bath in their water bowls every now and then (whenever they feel like it). It's not a very efficient bath (lots of preparation, lots of gyrations but they never end up with a wet back ) but it's what they like and, apparently, also all they need (they are never dirty or even smell funny) so that's fine with me. Obviously all birds are different and prefer different things, but my boy loves the shower, he gets so excited! I only ever put the shower on very gently, but its like rain for him. failing that he will also take a bath in the kitchen sink with the tap running gently. Sometimes he tries in his water bowl, which is actually really funny to watch! Yes, they all have their preferences - and, the funny thing is that they change it as they get older -well, except for the cockatoos and the cockatiels which ALWAYS prefer a 'rain' bath than a 'bowl' bath. Yup, my tiel prefers a spray bath and my budgie likes to bathe in a bowl. Sometimes, though, my budgie will try to take a bath in wet greens!